As a sequel to the popular 2014 post “The Flow of Time and Calendar Design”, I wanted to share a few more unusual calendar designs that intrepid artists have created. Calendars help us to visualize and organize our day-to-day lives, and these unique designs all serve a purpose in encouraging us to see time differently. Sure, 2015 is already half over, but it’s not too early to start thinking about 2016. 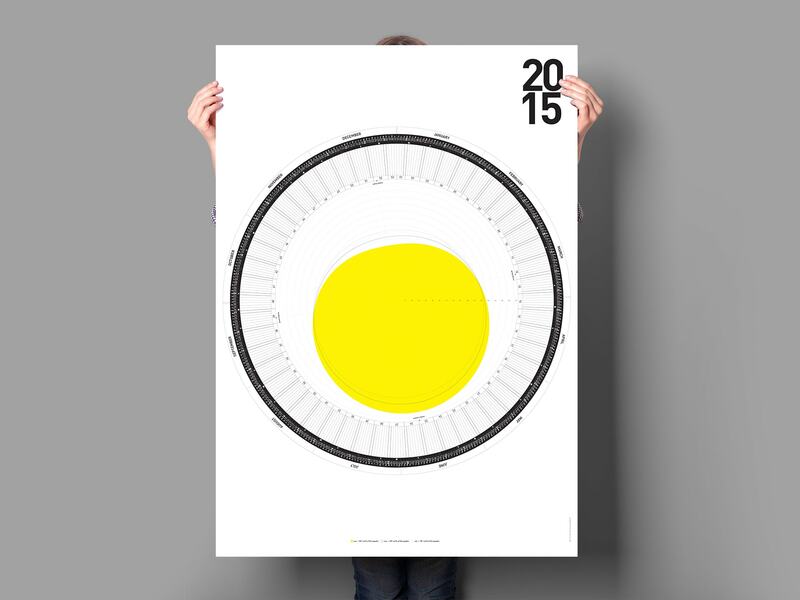 This Finish calendar is now in its 10th year. It follows the traditional design, except for the fact that two weeks, rather than one, are placed in each row. The letters for each month are spelled out by a phrase that changes every year. In 2015, they recycled the 2006 phrase for January: Jaws, Nuts and a Diary. The name of the calendar itself, Cats Let Nothing Darken Their Roar, spells out “calendar” if you take a few of the letters from the first four words. 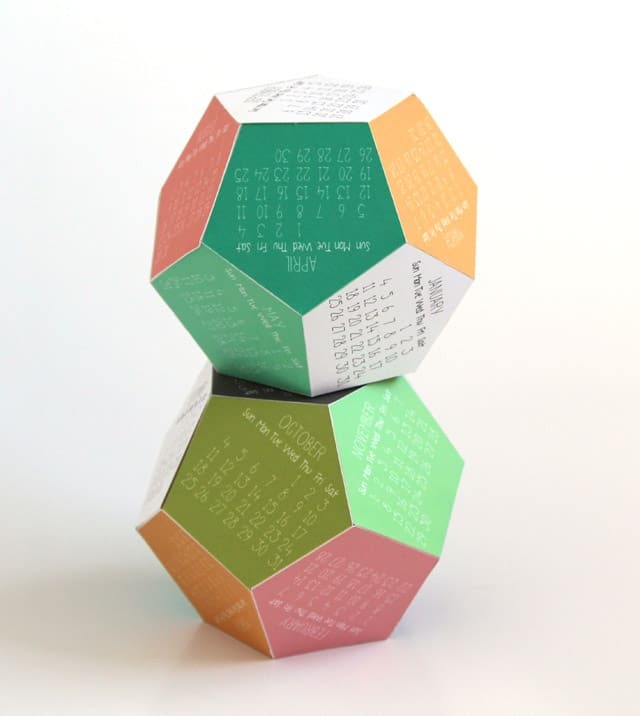 This calendar you can hold in your hand, as each of its 12 sides represents a different month. It makes for a colorful desk accessory and does not take up much space. Switching between months is relatively easy compared to flipping pages on a standard desk calendar. However, it is not nearly as practical, with little room to write events on the dates. The keys from a computer keyboard are the main ingredients for the above calendar. From a distance, it is a mismatch of faded colors and black marks. Look closer, and you will say months, days of the week, and numbers. The image above begins with Friday the 2nd, followed by Saturday the 3rd, etc. Once again, this is not the most practical way to organize your schedule, but it does give you an interesting image to ponder. When your entire year is represented by a collection of keyboard keys, it seems to change one’s outlook on time itself. Perhaps each day is simply a key waiting to be tapped? In this most unusual calendar, a bottle of very slow-moving ink is spilled at the beginning of the month and gradually fills in the month’s days in embossed paper. It takes 24 hours for each day to fill in with ink. I love the fact that this calendar keeps current on its own, and the flow of time is illuminated so tangibly. The entire year is again represented in one image, but this time it flows in a circular direction. The outside ring lists each month, and the next inside ring contains each day in that month. The most prominent feature is the giant yellow circle in the middle, representing the sun. Its position on a given day indicates the hours of daylight, which is why the sun is closer to the outside rings in the summer months. Of course I had to find a calendar which was also a map! This July 2013 desktop wallpaper calendar features a map which perfectly captures what July represents in the popular imagination: picnics, popsicles, and fans for cooling down. Time is the 4th dimension, after all, so it is only fitting that this dimension should be mapped accordingly. Hope you all enjoyed the calendars, and let me know if you’ve seen any other interesting designs which I may have missed!